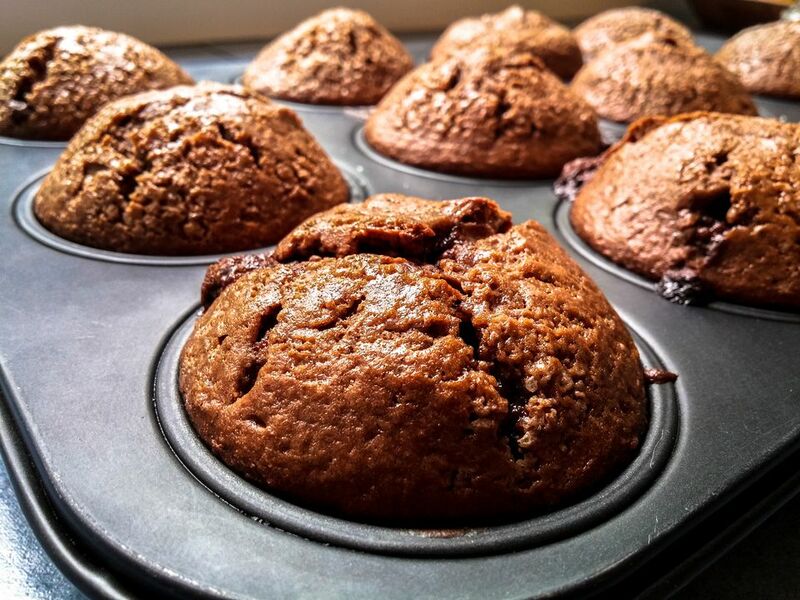 If you only use your overripe bananas for banana bread, next time you have browning bananas, consider these vegan chocolate banana muffins. You won't be sorry! Chocolate banana muffins are a versatile treat. They are perfect for a decadent brunch item, a tasty on-the-go snack, or even a sweet treat at dessert time. This recipe for vegan chocolate banana muffins calls for oatmeal and bananas. Don't let that trick you into thinking that it's health food. These are great muffins and perfect for vegan (or non-vegan) eaters alike. Since these muffins are egg-free and dairy-free, they are lower in fat than most chocolate muffin recipes and since they are vegan, that means they are cholesterol-free as well. This recipe makes about 20 muffins. Make sure you have enough muffin tins before you start, otherwise you'll be making a lot of batches of muffins. If you would prefer to make mini muffins, use a mini muffin tin and reduce the baking time just slightly. Once the toothpick comes out clean, the mini muffins are ready. You can also make a chocolate banana bread or loaf. Simply grease a loaf pan and follow the same recipe. You'll need to increase the baking time up to about an hour, but use the toothpick test to check doneness. Slice and serve plain, with fruit, or vegan whipped cream. If you like to add texture to your muffins (or bread), there are a wide variety of options. Add crushed walnuts, toasted coconut, raisins, or even vegan chocolate chips to the batter. You could also just sprinkle these toppings on top of the muffins just prior to baking. For a fancier presentation, dust the top of the cooled muffins with powdered sugar. The muffins can be kept on a plate on the countertop for a day or two. Any longer than that, wrap them in plastic wrap or seal in a container and store them in the refrigerator. Leftover muffins can also be stored in a zip-top bag and frozen for a quick grab-and-go breakfast or treat anytime. Defrost them on the counter or warm in the oven or microwave. Pre-heat oven to 400 degrees and line or grease a muffin pan. In a large bowl, combine the flour, oatmeal, brown sugar, cocoa, baking powder, and baking soda. In a separate bowl, whisk together the bananas, soy milk, vegan margarine, and vanilla. Combine with the dry ingredients and stir just until the ingredients are combined. Fill each muffin about 2/3 full with batter. Bake for 20 to 25 minutes, or until an inserted toothpick comes out clean. Let the muffins cool before removing the muffins from the muffin tin.